A lot of talent, a shared passion for food and amazing chemistry took two friends from YouTube to the small screen and they're here to stay. It all started with a text message. 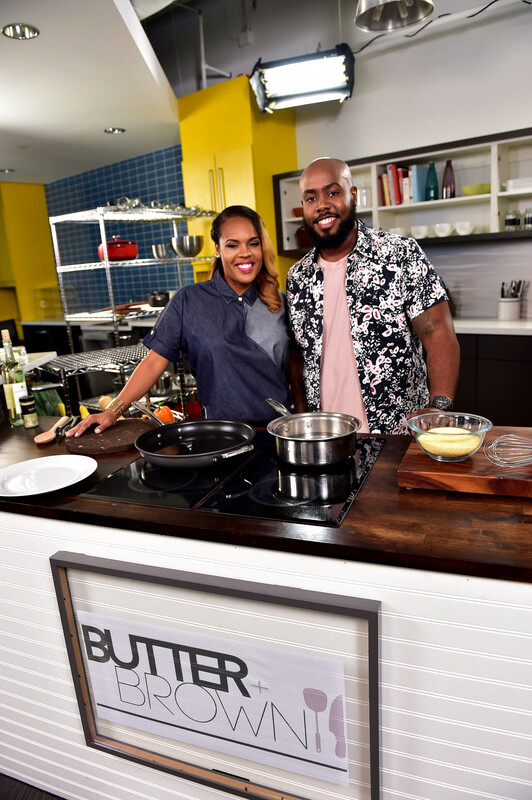 A simple introduction is how new cooking show Butter + Brown would ultimately come to be. Mutual friends encouraged web series host and writer Leslie Robinson and celebrity stylist and fashion writer Seth Brundle to meet, and while their chemistry wasn’t instant, it didn’t take long for their shared passion for throwing down in the kitchen to spark a unique and hilarious friendship with major business collaboration potential. With a little production help from their friend and colleague Issa Rae, Robinson and Brundle cooked up some magic on YouTube and their success on the viral video platform lead them right to their very own comical cooking show on Aspire TV that’s all about how to prepare delicious meals and tasty cocktails. Even better, their show is executive produced by none other than renowned meal maker Chef G. Garvin. How did your different collegiate experiences influence your culinary styles? Seth: It gave me exposure. [Prior] to me going to Morehouse, my family didn’t do much traveling. Our idea of a vacation was going from LA to Vegas. At Morehouse I really started traveling and getting exposed. Not only to different types of people, but different types of cuisine. My mom, I always credit her for my palate because growing up she always exposed us to different things. Leslie: For me, it was really just being exposed to eating out, dining. That was something that, growing up, I didn’t really do a lot because I come from a really big family. My mom and my aunts, they all cooked all the time, so going to college, and especially living in D.C., where there’s just a bunch of restaurants at your disposal, it gave me the opportunity to really see what it looked like to eat out and dine and that’s kind of where my real love for food began. I definitely ate at home and loved all that, but, funny enough, my mom always told me that I would never know how to cook, because I was never one of those kids who was underneath her in the kitchen. I always figured, just call me when it’s ready. She thought that I was just going to be living my life on takeout, but I ended up really starting to love food from going out to eat, and wanted to go home and recreate what I just tasted. Leslie: I really love Ina Garten and the fact that her whole show is based on back to the basics and elements, and it’s all about just learning flavors. Once you know how to make something taste a certain way, you can make it with any sort of protein, any sort of vegetable, because you’ve now learned how to build a flavor. If that’s a person that I could have lunch with and eat and just learn from her, I would love that. She’s who I tuned in to all the time on Food Network. Seth: For me, I would definitely have to credit Ina too, but I have to say Marcus Samuelsson, of course G. Garvin, who is our executive producer, and it is an honor, and it’s still kind of surreal for both of us that we have this opportunity to work with him, and to be mentored by him. He’s already been through everything that we’re up against now. Michael Simon actually, if there was a quote, and it’s in my bio’s everywhere on the website and everywhere else, but I always credit Michael Simon for changing my perspective about cooking. What essentially turned me into a great cook, he said, and I’m sure he wasn’t the one who came up with the quote, but it was, “learn a recipe, learn how to cook one dish, but if you learn a technique, you learn how to cook a thousand.” That completely changed my perception of myself as a cook and cooking in general. Leslie, how does being a mom influence or change your cooking style? My daughter soaks up Chopped and Master Chef and all of those things, and she’ll say all the time, “I want to go on Master Chef, and that’s what I’m going to do.” When I make food at home, she sits at the table and she says ‘I’m going to judge this like Gordon Ramsey.’ She’s like, ‘It could use a dash of salt,’ or something like that, but I’m also blessed in that my child will eat. She’s a little bougie. She was four years old, and her favorite food was sushi. That’s not typical of most four year olds. My kid is the girl that goes and orders the steak at a restaurant and says “please make sure it’s pink in the middle.” I can take her places and she can appreciate food and I’m not burning with having to just order chicken fingers and a lot of ketchup. I’m also just really blessed to have such a great husband who is just really supportive in everything that I want to do. I’m not in a place where I have to give up my family to do my career, and I’m really blessed to have that opportunity. Who are you just you both just dying to cook for? Seth: Leslie and I both want Ina to invite us to the Hamptons so bad please, please, please! My answer is probably more cliché, but I would love to cook for, to sit down and have dinner with the Obamas, but after they leave the White House. and I just want to have them over for dinner and just have a genuine conversation. Have a couple of glasses of bourbon, or wine, or whatever their thing is, and just ask them a bunch of questions about their experience in the White House, undergrad, and what it’s been like to be President, and the First Lady. I would absolutely love that. Leslie: I want to cook for Tracee Ellis Ross and Anthony Anderson. I think they would be so hilarious to cook for, and they would just be fun. I think that would be a riot dinner, and it would be great to even have it taped, because I can only imagine the jokes that would come out of that. Butter + Brown airs on Thursdays at 11 AM on Aspire TV.